One of the first steps to take after you decide to start a blog is choosing where you want your blog to be housed. There are two basic choices: have someone else host it, or host it yourself. Now don't get scared here. Self-hosting your blog sounds a bit intimidating but trust me, it is super easy. Self-hosting does not mean that you have to keep a pile of servers in your basement and a full IT staff. It simply means that you pay someone to host your site, but you still own all the rights. Think of it as renting space on the web and you still creating and owning your content. If you’re ready to make the big step, you can go self-hosted for under $3.95 a month right now. So, whether you’re starting a new blog or you currently have a blog on a free hosted platform you need to switch to over to being self-hosted. 1. You have full control over your blog. The number one reason that bloggers and other business owners choose a self-hosted website is the level of control and ownership over what you create. With a self-hosted website, you have your own domain name. You can install plugins, monetize and use ads, and change layouts and designs as you see fit. I started my blogging journey on a free blog. In the beginning, it was great. But I soon realized how they limit your designs and how they monetize your content. With a free blog platform, they own the content that you put up. You don't even own your work! If your blog is on a free platform, the platform owners can remove your content at any point for any reason. They are also free to place ads without your approval because they own your blog. So in conclusion, a free platform can work for your blog it is only a hobby or way or sharing your family outings with friends. If you are planning to someday try and monetize, then you need to be self-hosted. 2. You get to decide your layout and how your website looks. You have probably noticed instantly when you land on a free blog while browsing the web. They all have the same look. When building a website on a free platform, you are building on their terms. You only get to pick from a couple of designs, and those designs are the same that a few other million bloggers use. When you are self-hosted, you can customize everything and the options are limitless. WordPress.org has over 1,000 themes to choose from and all of the premium themes are fully customizable. You can also find and install premium themes from third-party designers. I started with a free theme from wordpress.org and now after I learned my around WordPress I use the Genesis Framework from StudioPress. You have to be careful when searching for WordPress online. Always go to WordPress.org and avoid wordpress.com. WordPress.com is a free platform, but remember, you won't actually own your content. Many of the free hosting platforms don’t allow, or severely limit, you to monetize your site. In, addition to you not being able to profit from your site, free platforms can display ads on your site that you have no control over at all. To get a return on all your hard work then you need to make the leap to being self-hosted. You should be making money with your blog and that is impossible on a free platform. Going self-hosted is so affordable, at just $3.95/month. But the best part is that it ends up paying for itself because it allows you to start earning from your blog. 4. You will see SEO benefits. I am sure that you have been hearing about how important SEO is for your business growth. SEO is a free way to get in front of people who are looking for content like yours. A good SEO strategy can move you to the top of Google results. A self-hosted website allows you to optimize your content for search engines in a more efficient way than on free platforms. Hosting companies like SiteGround, also have built-in SEO features that can really help your site get discovered and take seriously by search engines in the long run. 5. You have access to over 55,000 plugins. In addition to all the themes you can choose from there are also thousands of plugins you can install separately to meet the needs of your website. WordPress currently has 56,318 plugins and developers are making more available all the time. The awesome thing about it is that most of these are completely free or have free versions available for use on your site. Your readers experience on your site and the functionality will be vastly improved by having access to these amazing plugins. 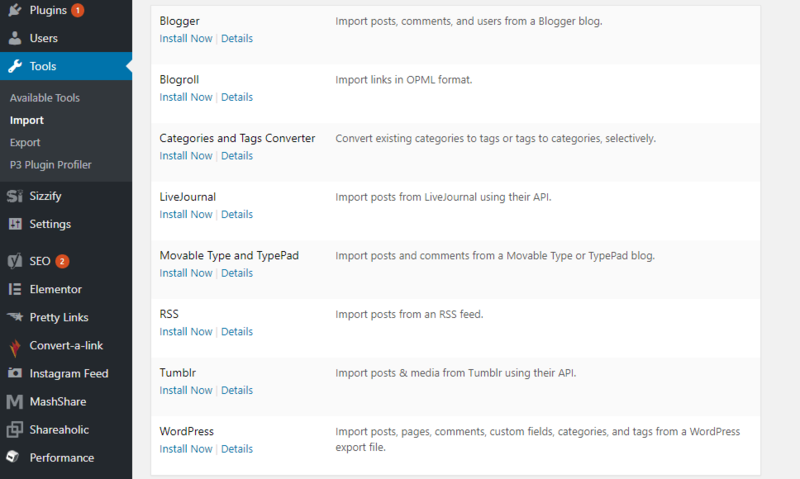 As you may have guessed by now, these plugins are only available when your site is self-hosted. These plugins let you set up your website to look and perform the way that you want, without having to touch the code at all. Plugins can help you build a faster, more secure, and overall better site. Another feature that comes only with a self-hosted website is a custom domain name, AKA your URL. When you use a free service, your domain name will almost always be an “extra” extension to the service provider’s own domain. For example, if I created A Dollar Earned on Tumblr, the web address would be http://adollarearned.tumblr.com instead of https://www.adollarearned.com. Now which one looks like a business? With a self-hosted blog, both your URL and website appearance look more professional. If you want to be taken seriously you need to be self-hosted. 7. You will build trust with readers and brands. Having a professional website plays a huge part in earning the trust of your audience and the attention of brands or fellow bloggers you might want to partner up with. Remember that people only need a few seconds to form an opinion of you and it is the same for your website. Most people can tell from your URL when you’re using a free hosted platform, or when you’re self-hosted. If your potential partners, clients, and customers can see that you aren’t willing to invest in your site, they’re unlikely to take you seriously and trust you as a business. Are you convinced yet? What are you waiting for? Every day on a free platform is a day of SEO and monetization missed. No worries though, you can go self-hosted in just a few easy steps. There are two main elements of having a self-hosted site. The host and the platform. Think if it like the host is your landlord and the platform is your apartment. The most popular hosting and the one that I 100% recommend is Siteground.com. WordPress.org is the most popular website platform and the one that I love. So if you are ready, lets dive in. 1. Sign up for hosting with SiteGround and get your domain name. As we discussed previously, going self-hosted means that you are independent of any blogging platform. You will own the rights to your own website and do pretty much whatever you like with it. A hosting company allows you to do all that by storing your website on their servers. Go to SiteGround and click Sign Up! If you need help starting a blog from the beginning I can help you here! The next step you’ll need to take is to install WordPress as your platform to manage your new self-hosted website. The good news for you is that Siteground will do it all for you with just one click! If you need help setting your blog up with Siteground, or if you’re starting a blog from scratch, read my tutorial on How To Start A Blog In 7 Easy Steps. Now that you have everything set up, it’s time to make the big move! The first thing you want to do is to go into the Dashboard of your old, free blog and under the “Tools” section > “Export” (in WordPress.com – it might differ a bit on other platforms) you will find a button that says “Download Export File”. Finally, Make sure you select “All content”, so this way, the file you download will contain everything that was on your old blog. Once the file is downloaded, log into the WordPress dashboard of your new self-hosted blog and follow the same process, only this time go to “Tools” > “Import” > “Install Now” and select the platform you are importing from. From here, you will be prompted to download a free WordPress plugin that will deal with the import. All you’re going to have to do is to select and upload the XML file you just exported from your old blog. If you need more information on this step here is a quick guide. Congratulations! Your new blog will be up and running and ready to be customized according to your needs. Did you start out self-hosted or did you switch a bit into your blogging journey?